Diabetes mellitus, the most common type of diabetes in dogs, usually affects older dogs from 7 to 9 years of age, says dog trainer Norma Bennett Woolf. A lack of insulin causes diabetes mellitus, which is similar to diabetes in humans. Diabetes insipidus—another, less common type of canine diabetes, occurs because of a lack of vasopressin, which is a hormone that controls water reabsorption in the dog’s kidneys. The early symptoms of canine diabetes include excessive urination and thirst. The overproduction of glucose in the dog’s system means that glucose mixes with the dog’s urine, causing frequent urination, according to Mar Vista Animal Medical Center in Los Angeles. This in turn causes excessive thirst. Other canine diabetes symptoms include weight loss, cataracts, lethargy, weakness, shaking and sweet smelling breath, says Vet Info. Diagnosis of canine diabetes involves a physical examination. The vet then takes samples of the dog’s blood and urine and tests them to determine the glucose levels. The vet also looks for ketones in the dog’s fluid samples. Ketones are organic compounds produced by the liver because of a lack of insulin in the dog’s system, says Norma Bennett Woolf. Older dogs are at a higher risk for developing canine diabetes. Infectious diseases and viruses raise the risk of an older dog getting diabetes, says Diabetes in Dogs. Preventing diseases and viruses in your dog by keeping it healthy and up-to-date on vaccinations reduces the risk of the dog developing canine diabetes. Feeding a well-balanced diet and keeping a daily exercise routine helps keep dogs’ immune systems functioning, which helps prevent disease. 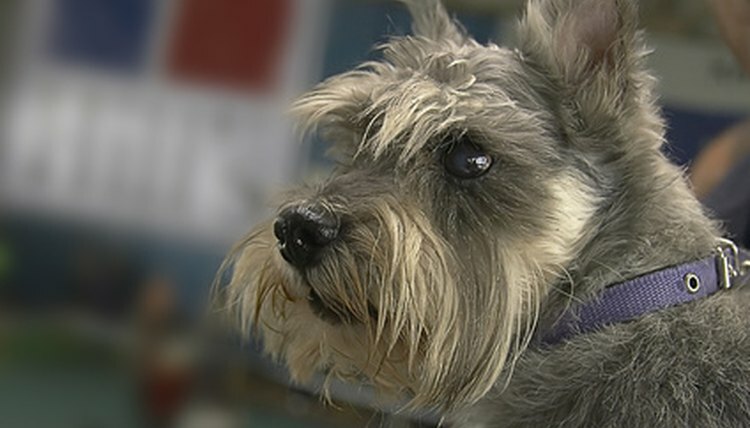 Treatment of canine diabetes involves insulin, the type and amount of which vary from case to case, according to Mar Vista Animal Medical Center. Twice daily insulin injections after mealtimes are normal for diabetic dogs. Each dog’s dose is determined by its veterinarian, and must be adhered to by the owner, recommends Mar Vista. Canine cataracts caused by diabetes appear quickly and can cause blindness in a matter of weeks if left untreated, according to Mar Vista. Surgery is required to remove the cataracts, and veterinarians only agree to surgery if the dog’s diabetes is under control with medication.